Premium Memory Quilts are Everywhere! This past month has been a whirlwind for me. My shop continues to be incredibly busy with over 20 quilts on the schedule! Many, many quilts have left my shop and are now wrapped around you or your loved ones! This month I am highlighting rock stars and some other unique quilts I have made. 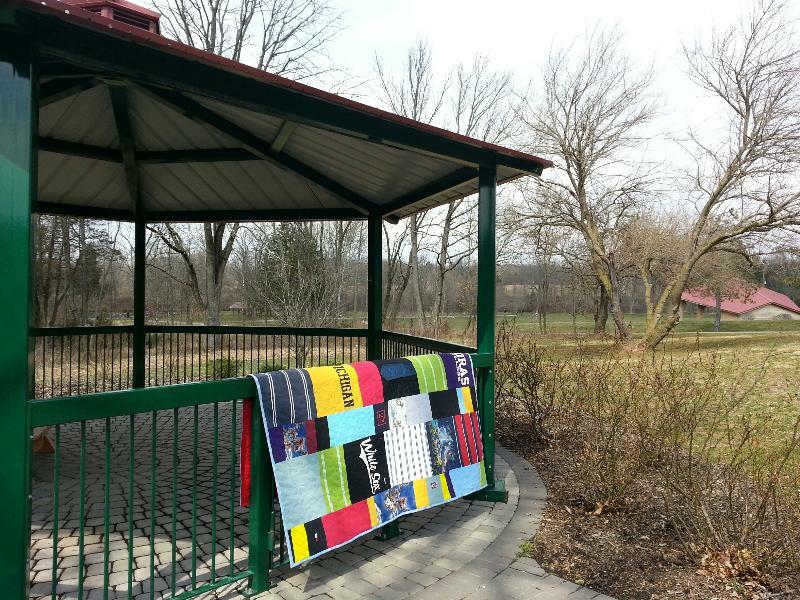 It is amazing how each quilt tells a person's story through fabric, whether that story is sports, school, music, theater, gardening, or beautiful memories. The fabric does indeed tell the person's story in a beautiful way! Rod Stewart, Stevie Nicks, Bob Marley, Eric Clapton, Van Halen, The Stones, and John Lennon are some of the rock stars found in the quilts I have made recently. Music tells a lot about a person! It plays an important role in our lives as proven by these premium, handmade quilts filled with concert shirts..... ROCK ON! 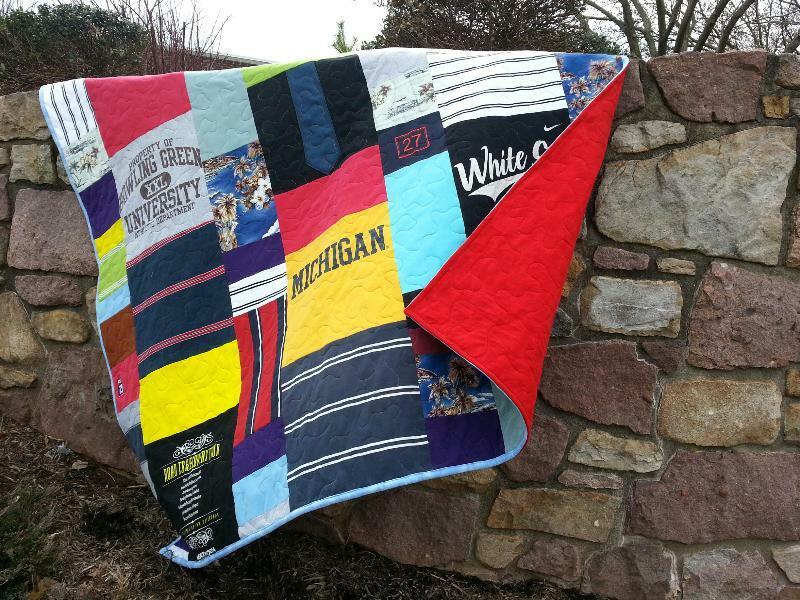 This 90" by 108" traditional style queen size quilt was made with 56 t-shirts and sweat shirts from some really great schools. 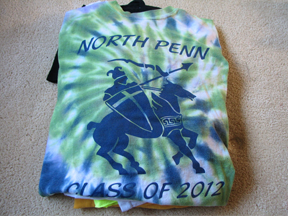 The premium sashing was made in the Georgetown colors of gray and blue. A gold and gray high quality fabric was selected to use as the backing making this quilt truly reversible! 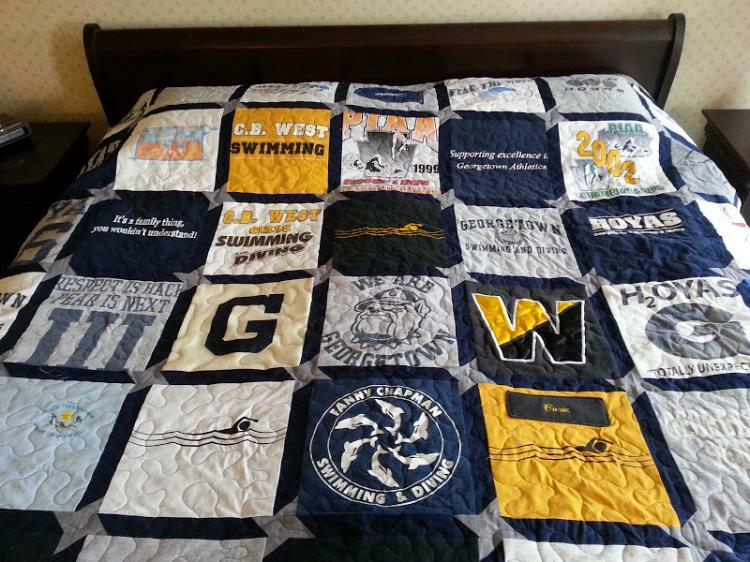 This quilt illustrates an amazing story of academic success AND athletic success! Also depicted is an amazing amount of dedication to Georgetown and the sport of swimming. 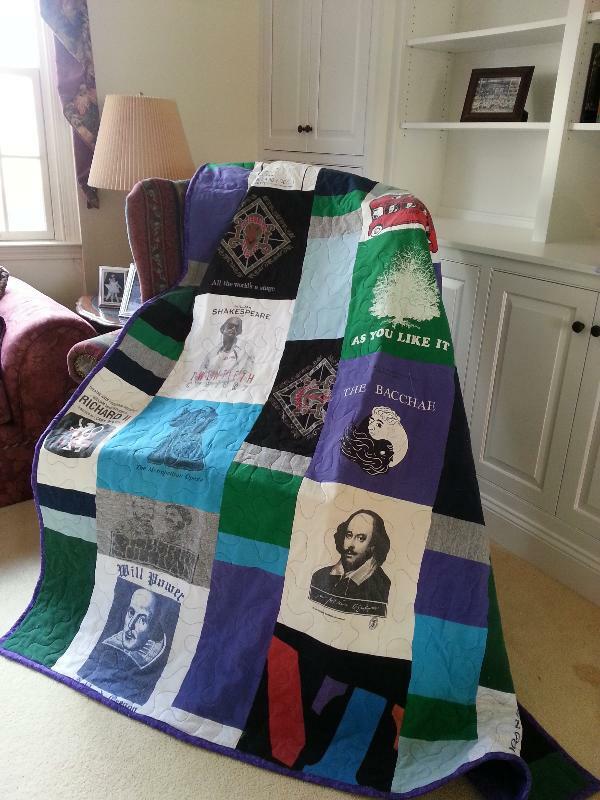 This modern style lap quilt is depicting the story of a thespian from the University of Pennsylvania. It has over 20 shirts from the many plays he was in. What a great birthday present! Over the past several months my Memory Quilts have been written up in 3 different websites! I am so very thankful for the kind words and pictures! It is nice to know my quilts are so appreciated and loved. Much love goes into making them. 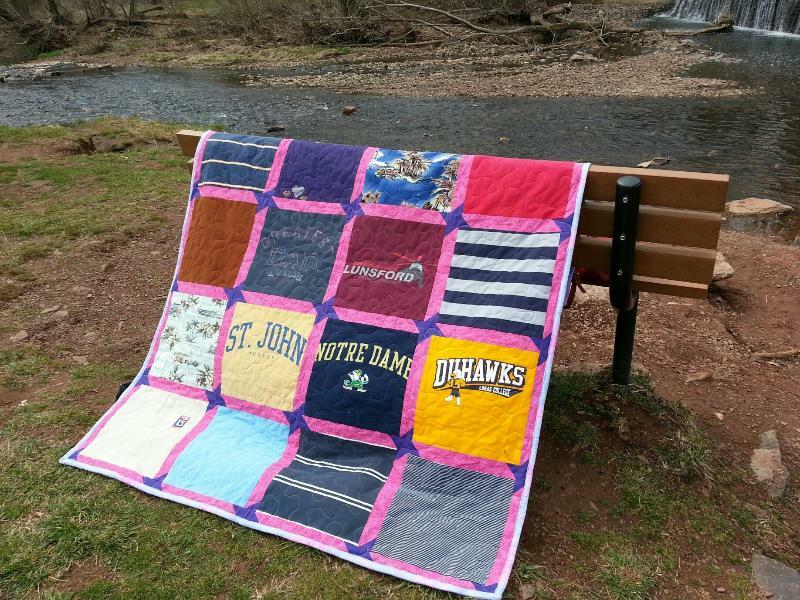 Below is a write up about a Memorial Quilt that I made for a person who recently lost their brother. 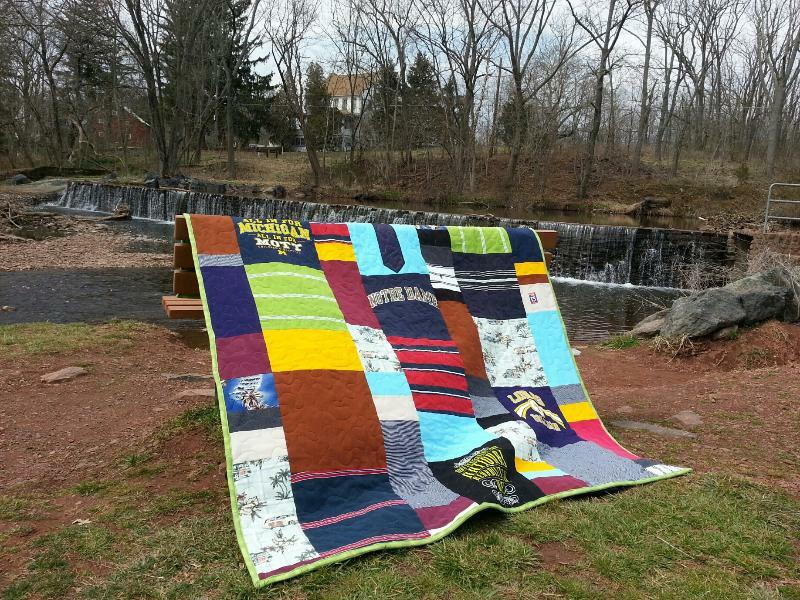 This family will receive 3 quilts in honor of Willy. 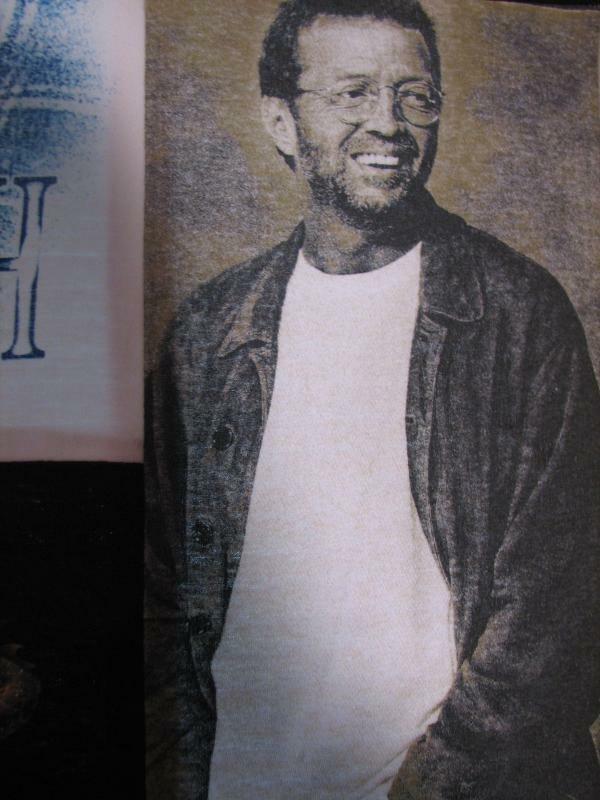 These quilts tell the beautiful story of a person who, sadly, is no longer is with us. This modern style, twin size quilt reveals a brave fireman that happens to be a devoted Patriot's fan and a Rolling Stones and Rod Stewart fan! Particularly sweet is the yellow Mickey Mouse block that was his wife's favorite night shirt! I am quite certain that he was surprised by this wonderful keepsake! A Day at Fischer's Park! This traditional style, large lap quilt is telling the sweet story of a devoted mother who is no longer with us. The fabric illustrates her love of gardening, humming birds and Florida! It even has her picture. I sincerely hope that this quilt brings comfort and lasting memories that can be cherished for years to come. To all my iPad and iPhone users out there: All of my photo albums are now visible on your devices. After some lessons in Adobe Flash that is ;) Check them out, click here.